With Extra Care Protection, your new Toyota has inflation-protected coverage from unexpected mechanical failure, road emergencies, and much more. It is the affordable and cost-effective way to guarantee your peace of mind and protect your investment regardless of whether you buy or lease. 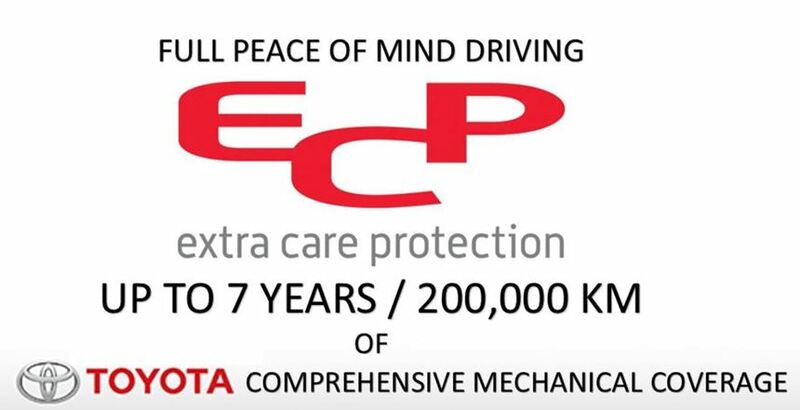 ECP will enhance the quality experience of owning your new Toyota, while helping to provide enhanced resale value in the future. You have your choice of terms, with a wide range of kilometre limits to suit your driving needs, and have access to service from over 1500 Toyota dealers across North America. Yes, and it’s one of the best! However, ECP offers much more. It can provide you and your Toyota with coverage such as towing, emergency road service, rental assistance, trip interruption assistance, tire road-hazard protection, and travel-planning assistance. It can take over with mechanical protection when your Toyota factory warranty ends, providing coverage for up to seven years or 200,000 kilometres. Extra Care Protection enhances the resale value of your Toyota. Simply complete, sign, and return the transfer form. There is no extra charge for the transfer! 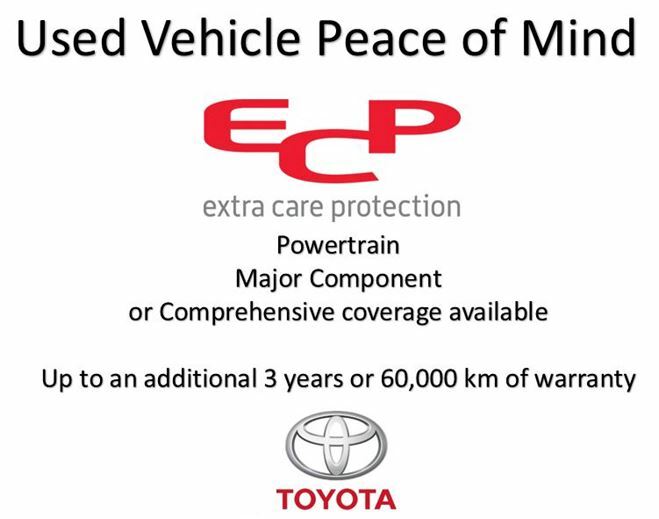 ECP gives you better value, even when you sell your Toyota. For more information on Toyota Extra Care Protection, please contact Collingwood Toyota’s Business Office by toll-free phone at 1-877-445-1414, or email businessoffice@collingwood.toyota.ca. The ECP Comprehensive Coverage gives you all the benefits of the Powertrain Coverage Plan plus the Major Component Coverage Plan. We have you covered with 16 mechanical component groups. The Comprehensive Coverage Plan is available for vehicles up to seven model-years old. With Extra Care Protection, your used vehicle purchase can benefit from inflation-protected coverage for unexpected mechanical failure, road emergencies, and much more. It is the most affordable and cost-effective way to guarantee your peace of mind and protect your investment. ECP will enhance the quality experience of owning your vehicle, while helping to protect the resale value down the road. You must purchase your plan at the same time you purchase your used vehicle. ECP offers much more. Whether you lease or buy, it can provide you and your vehicle with coverage for services such as towing, emergency road service, rental assistance, trip-interruption assistance, and travel-planning assistance. It can cover your used vehicle when your factory warranty ends, providing coverage for terms up to 36 months or 60,000 kilometres–whichever comes first. Extra Care Protection enhances the resale value of your used vehicle. Once you sign the agreement and fill out a transfer form, we can take care of the rest. No cost, no fuss, no hassle. Extra Care Protection is affordable when you buy and can add resale value to your vehicle because many buyers prefer vehicles with ECP coverage. Extra Care Protection is available on all used Toyota cars, trucks, and SUVs, including select luxury vehicles. Ask your Salesperson about eligibility and assure yourself you are protecting your investment. For more information on Toyota Extra Care Protection, contact Collingwood Toyota’s Business Office by toll-free phone at 1-877-445-1414, or email businessoffice@collingwood.toyota.ca.